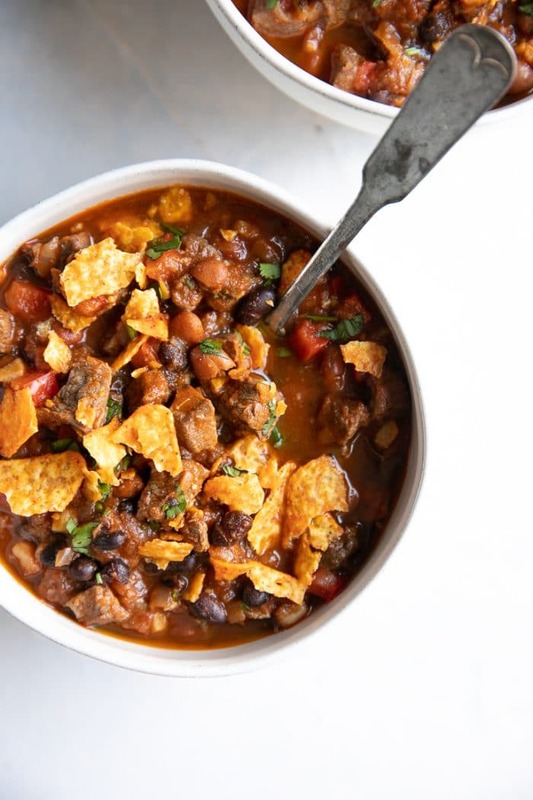 Cozy and comforting, this Easy Steak Chili Recipe comes filled with black beans, sweet bell pepper, and the juiciest, most tender bits of steak. Serve with your favorite toppings, and enjoy with the whole family for an easy, delicious, filling meal that’s perfect any night of the week! From fresh produce to canned goods and my must-have nightly ice cream (just kidding, not every night), I often find myself at Safeway for all my family’s must-have essentials (and not-so-essential wants). Lucky for me (and all you other Safeway shoppers), it’s that time of year again…time to play the SHOP, PLAY, WIN!® Collect & Win Game featuring MONOPOLY! I am a BIG fan of games and free stuff, so this is always one of my favorite times of year to go grocery shopping. And with $250 million dollars worth of prizes and money-saving offers this year, I’m thinking we all have a pretty good chance of winning something. Something like, maybe…just maybe…a $1 million dollar cash prize! 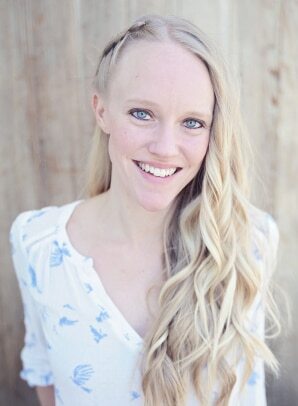 Or a fancy new vacation home, car, kitchen makeover, or loads of other prizes. 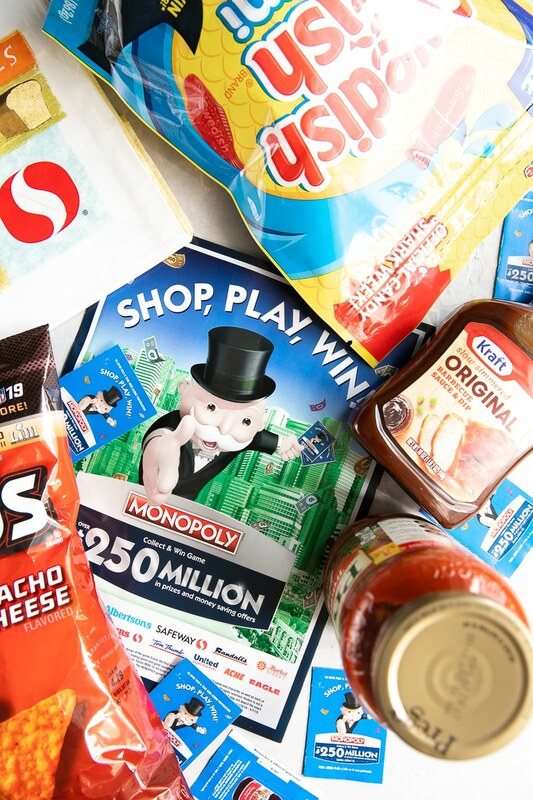 There’s always a chance…BUT grocery shopping with the MONOPOLY Collect & Win game is SO MUCH FUN. I play the MONOPOLY Collect & Win game at my local Safeway, but you can Shop, Play, Win! at any of the Albertsons Companies stores like Albertsons, ACME Markets, Jewel-Osco, Vons, Pavilions, Randalls, Tom Thumb, Shaw’s, Star Market, Carrs/Safeway, United Supermarkets, Amigos, Albertsons Market and Market Street stores. Pick up a MONOPOLY Collect & Win game board from your local Safeway store. 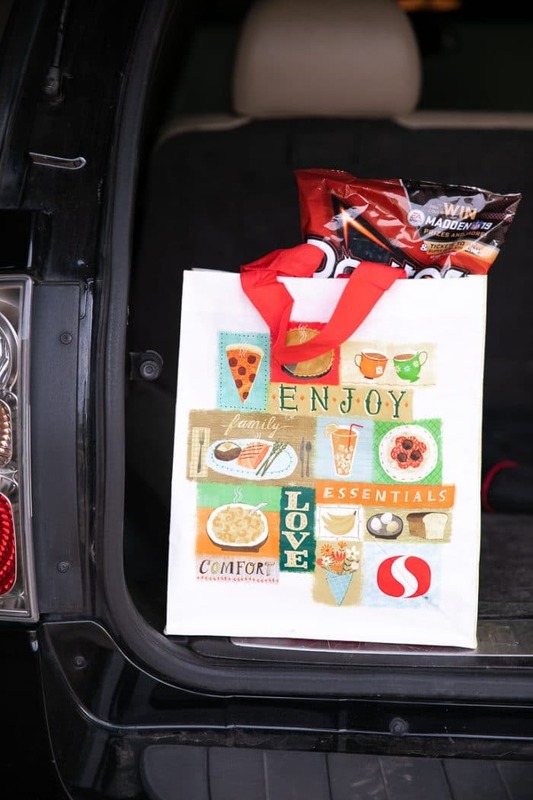 Every time you shop at Safeway, you will receive a game ticket PLUS additional bonus tickets whenever you purchase specialty tagged products (such as Prego Pasta Sauce Traditional or Swedish Fish Red Bag). 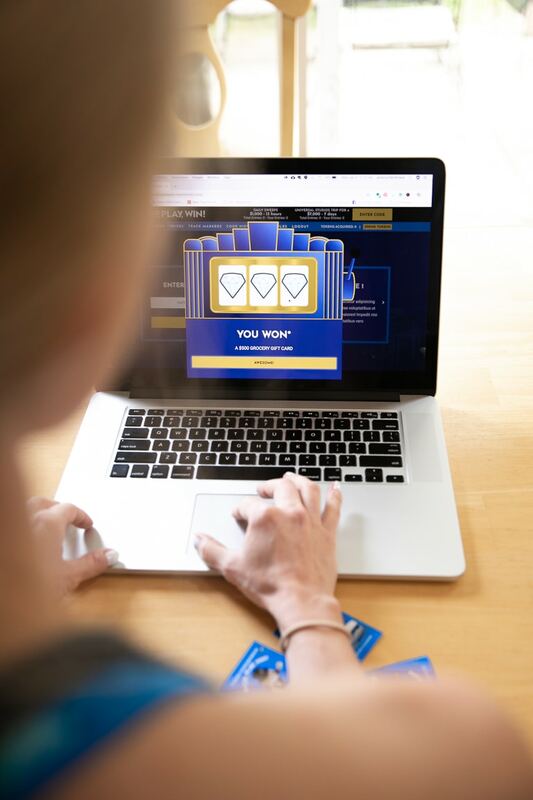 Inside each game ticket, you will find 4 game markers and either an in-store coupon, an online game code, instant win prize or 2 free game tickets prizes. Gently tear the tickets at the perforated lines and find the matching code on your Monopoly Collect & Win game board. Wet the glue strip on the back of the official game markers and place on the exact corresponding prize area. Do not use glue or tape. For all you tech-savvy wizards, you can also enter for a chance to win online (But really, it’s so easy!) Anyone can visit ShopPlayWin.com to participate. Head over to www.shopplaywin.com and enter the 16-digit alpha-numeric code found on certain game tickets or download the SHOP, PLAY, WIN!® app to scan your online game codes! To bring home a few extra game tickets and feed my family, I thought it would be fun to make a recipe with a few go-to products for the MONOPOLY Collect & Win Game. But this isn’t just any chili, you guys. 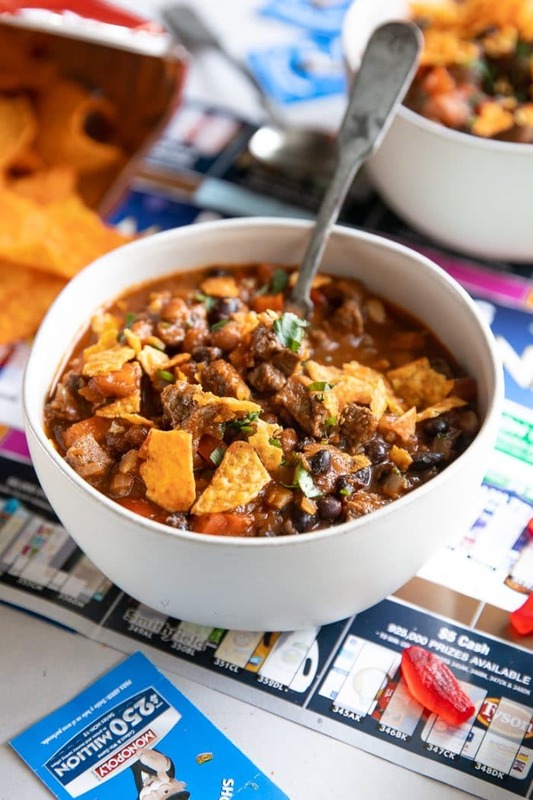 Skip the ground beef and surprise your family with this irresistibly delicious chili recipe made with tender bites of steak, black beans, hints of BBQ sauce, traditional pasta sauce, and topped with crumbled Nacho Cheese Doritos. 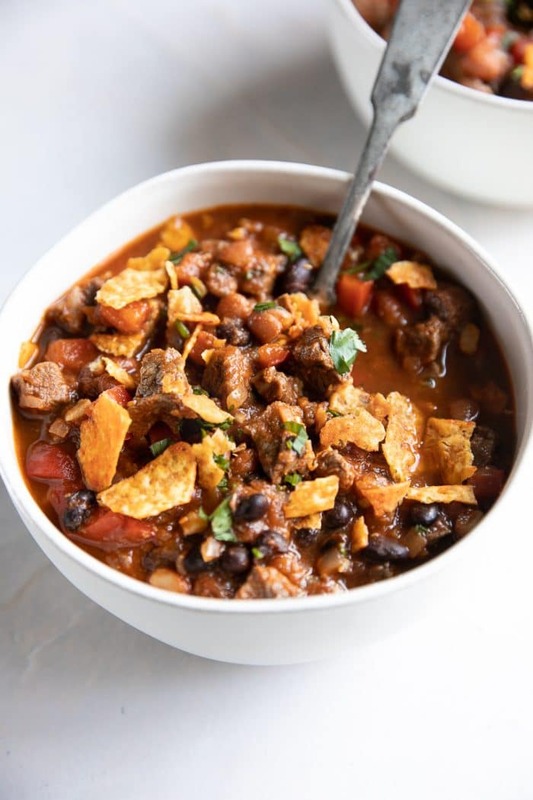 A fun change from classic beef chili, this steak chili recipe is just as easy and delicious as the classic. 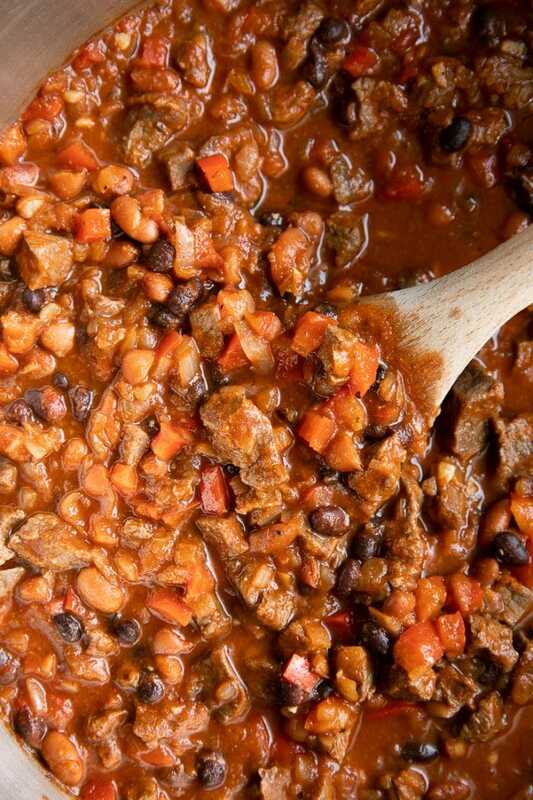 Making a big pot of this steak chili is super easy! The most tedious part of the whole recipe is cutting the steak into small pieces, but I did this on purpose as I wanted small, tender pieces of meat rather than large chunks. Prepare your ingredients. 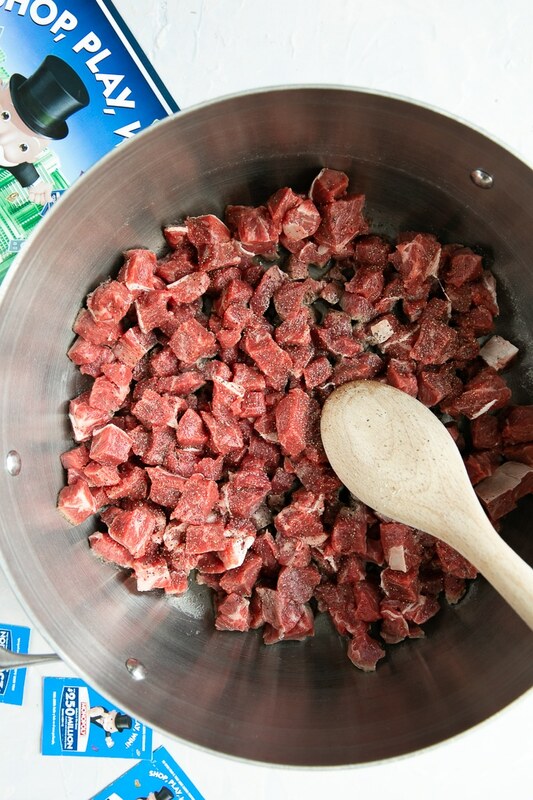 Starting with the steak, remove any tough pieces and cut the remaining meat into small, uniform-sized bits. Transfer the steak to a bowl. On a clean cutting board, mince the onion, garlic, and bell peppers. Set those aside. Brown the meat. In a large, heavy-bottomed pot or Dutch oven, add the olive oil and butter. Once hot, add the steak to the pot and cook, stirring often until brown on all sides. The steak doesn’t need to be fully cooked, however, given that the meat is chopped so small; it really only needs a few minutes to be browned on all sides. Cook the vegetables. 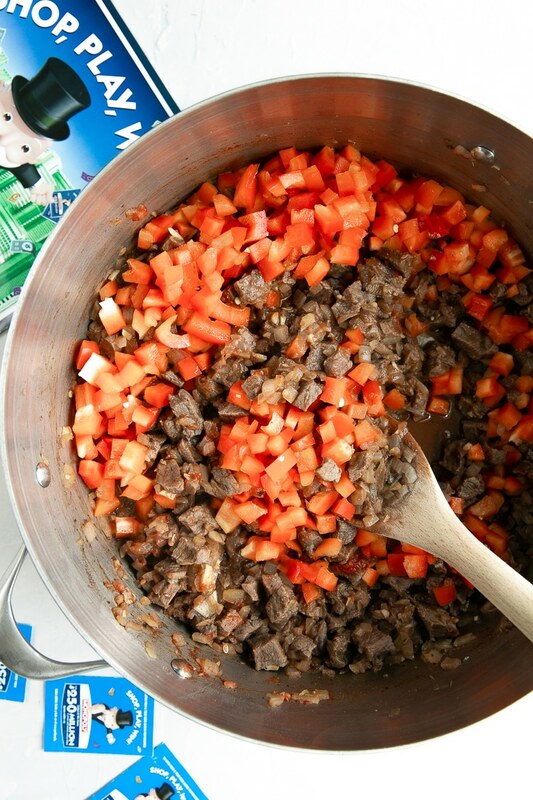 Once the meat is browned, add the onions, garlic, and bell peppers to the pot. Mix well to combine with the steak, and cook all together for approximately 6-8 minutes. Add the tomato paste and seasoning, mixing well. Cook for one minute before stirring in the pasta sauce, chopped tomatoes, and beef stock. Bring to a low boil, cover, and simmer for approximately 20-30 minutes, stirring occasionally. Add the BBQ sauce, black beans, and cannellini beans. Simmer for an additional 5-10 minutes before seasoning with additional salt, pepper, or BBQ sauce to taste. 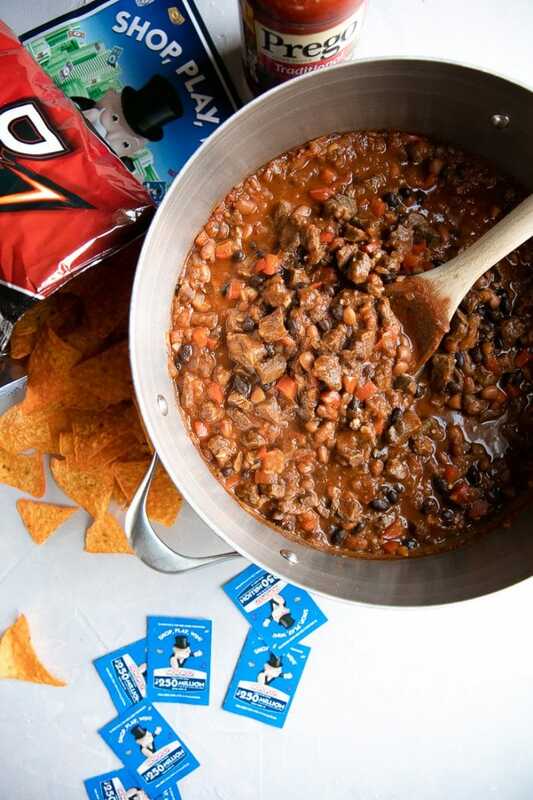 The best thing about this steak chili is that it doesn’t really need any additional toppings. 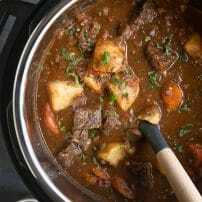 Whereas some soups and stews need toppings to help bring out or tie together the flavors, this steak chili recipe is fantastic as is. 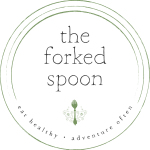 This makes it especially awesome because without any additional toppings, it is completely dairy-free and gluten-free (this may vary depending on the type of BBQ sauce and pasta sauce used, so be sure to check the label). It is also incredibly high in protein and fiber thanks to all that delicious meat and beans. 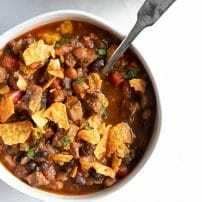 Cozy and comforting, this Easy Steak Chili Recipe comes filled with black beans, sweet bell pepper, and the juiciest, tender bits of steak. 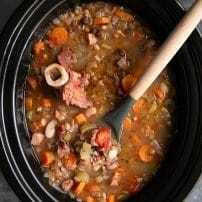 Heat a large Dutch oven or heavy bottomed pot over medium-high heat. Add the olive oil and butter, swirl to coat the bottom of the pot. Add the steak, seasoning well with salt and pepper. Cook until steak is browned on all sides, approximately 2-3 minutes. Add the onions and mix well to combine. Cook the onion until just starting to soften, approximately 3-4 minutes. Add the garlic and bell pepper. Stir to combine and continue to cook over medium heat for an additional 3-4 minutes. Over medium heat stir in the tomato paste, Italian seasoning, chili powder, and cumin. Cook, stirring constantly, for 1 minute. Increase heat to medium-high and add the pasta sauce, chopped tomatoes, and beef stock. Stir well to combine. Bring to a simmer, cover, and reduce heat to low. Simmer, covered, for approximately 20-30 minutes. Remove the lid and add the BBQ sauce, black beans, and cannellini beans. Mix well to combine. Simmer for an additional 5-10 minutes before seasoning with additional salt, pepper, or BBQ sauce, to taste. Serve with your favorite garnishes including Doritos Nachos Cheese, shredded mozzarella, chopped cilantro, and green onion. Enjoy! The Steak Chili looks most excellent. 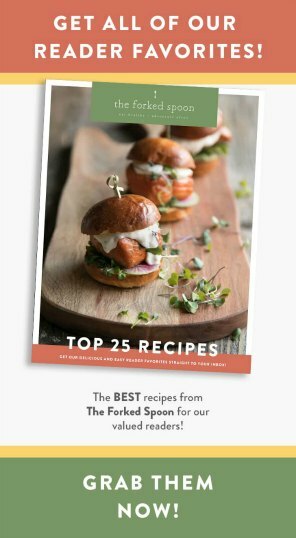 Well done on dreaming up this recipe! 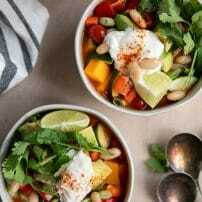 A great meal idea for this super cold weather!